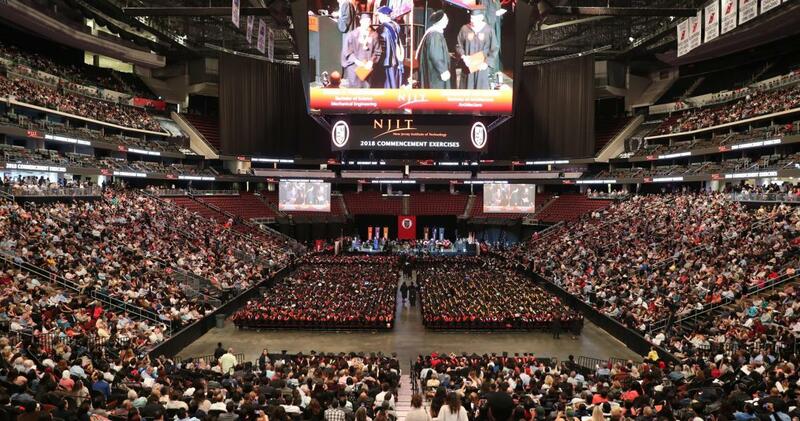 New Jersey Institute of Technology (NJIT) will award more than 3,000 baccalaureate, master’s and doctoral degrees at the 103rd Commencement exercises May 21, 2019, and May 23, 2019, at the Prudential Center and at NJIT’s Wellness and Events Center, respectively, in Newark, New Jersey. The university also will confer honorary degrees on three distinguished individuals May 21, 2019, at the Prudential Center in Newark, New Jersey. New Jersey Governor Phil Murphy will deliver the 2019 Commencement address and receive an honorary Doctor of Humane Letters. On March 5, 2019, Governor Murphy presented his Fiscal Year 2020 (FY2020) budget – a plan to put New Jersey on a responsible path forward through over $1.1 billion in sustainable savings and targeted investments in NJ TRANSIT, school funding, social services and property tax relief. The Governor’s budget includes $20 million in new funds to pilot a new funding formula for public four-year institutions of higher education, rewarding student completion and supporting traditionally underserved populations. Along with Secretary of Higher Education Zakiya Smith Ellis, Governor Murphy unveiled a plan to transform the state’s higher education system by making it more accessible, affordable and transparent. In addition to retaining more New Jersey students, the governor established a goal to unite the state’s institutions of higher education to boost the economy by improving the school-to-workforce pipeline. The Higher Education Plan is intended to support Governor Murphy’s economic development strategic plan – “The State of Innovation: Building a Stronger and Fairer Economy in New Jersey” – to set New Jersey on the path to a stronger and fairer future where innovation and diversity are at the forefront of the State’s economy. As Governor Murphy laid out the objectives of the economic development strategic plan, he affirmed that the success of the plan will hinge on inclusivity – of women, people of color and immigrants, and a renewal of the State’s leadership in innovation. Governor Murphy’s economic vision for New Jersey includes growth of an innovative, technology-driven sector. Clifford M. Samuel ’88 will receive an honorary Doctor of Science. Samuel is Senior Vice President of Access Operations and Emerging Markets at Gilead Sciences, with responsibility for more than 130 countries around the world. He joined Gilead Sciences in 1996 as a member of the company’s commercial organization, newly established at the time, to support the introduction of Gilead’s first commercial product. Today, Samuel oversees the ongoing development and implementation of innovative manufacturing, distribution and business models to make the company’s HIV, viral hepatitis and fungal medicines available at affordable prices in resource-limited and evolving economies. Samuel received his bachelor’s degree in mechanical engineering from NJIT, and serves as a member of the NJIT Honors Program Board. He was awarded the Edward F. Weston Medal for Professional Achievement by the school in 2010 and in January 2019 was elected to the National Academy of Engineers. Sandra A. Carter, vice president of Windows and Enterprise Workloads at Amazon Web Services (AWS) focused on helping companies to innovate using technology, will receive an honorary Doctor of Science. Prior to joining AWS, Carter spent a decade at IBM. She is the author of Extreme Innovation: Three Superpowers for Purpose and Profit, built on her research with Carnegie Mellon. Carter was named Lifetime Achievement Winner, 'Excellence in Cloud Achievement' for 2019, Top 10 AI Influencers for 2019, Top 39 Engineers by Business Insider 2018, Top 50 AI influencer by Onalytica 2018, Top 10 Future of Work influencer in 2018, Most influential global marketing leader by World Marketing Congress 2018, Top 3 Innovation Influencer at SXSW in 2017, Top Digital Influencer in 2016 by Forbes, and Top 10 Women in Technology by CNN.